A Spooktastic Halloween was had by all! Here in Sleepy Hollow, New York, we experienced a veritable cornucopia of Halloween events this past weekend. We at Travellati Tours took a large bite out of this cornucopia (uh, is that a mixed metaphor?) 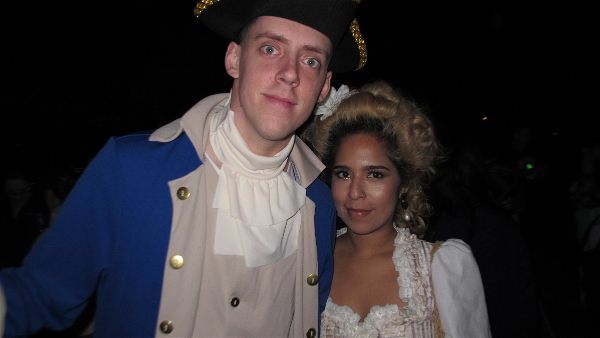 with several Sleepy Hollow Halloween Tours. 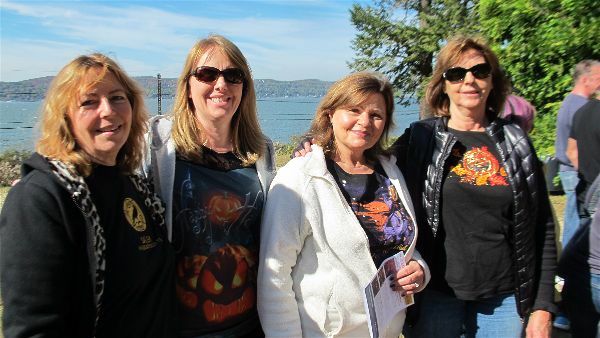 Guests came from as far away as Rochester, NY, Pennsylvania, Plattsburgh, NY, and Chicago to enjoy the riches of Sleepy Hollow’s Halloween traditions. I am happy to report, a spookalicious time was had by all! Guests from Chicago with docent in front of Washington Irving's family plot in Sleepy Hollow Cemetery. Photo Travellati Tours. Our events included a private tour of Sleepy Hollow Cemetery, where the great, wealthy, and not so great are buried, including the Rockefellers, Leona Helmsley and her dog, and of course, Washington Irving and his family. 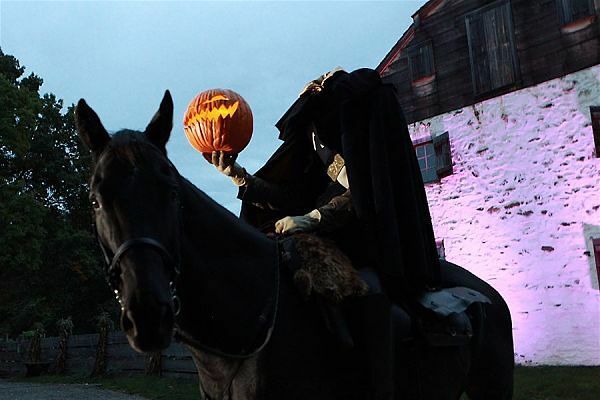 After all, Irving and his famous story, “The Legend of Sleepy Hollow,” is the reason we’re all celebrating Halloween here in Sleepy Hollow country like there’s no tomorrow! 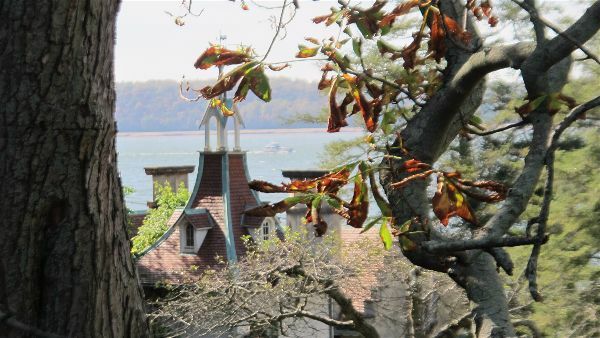 View of Washington Irving's home Sunnyside with the Hudson River in the background. Photo Travellati Tours. We also visited Irving’s picturesque home Sunnyside on the banks of the mighty Hudson River near Irvington, NY. Well, it wasn’t called Irvington at the time, it was Dearman. But late in Irving’s life, the townsfolk wanted to rename it in honor of their local legend – there was only one “Nay” vote: Irving’s. 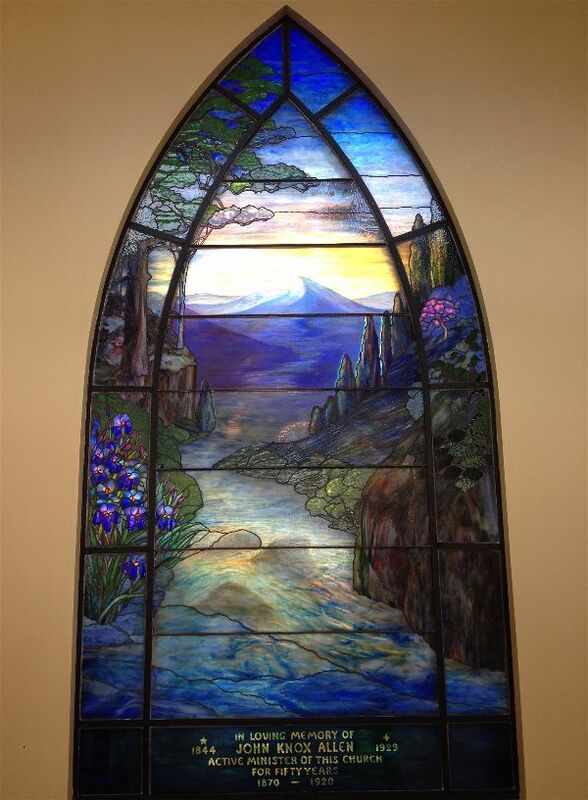 Tiffany window at the Reformed Church of the Tarrytowns. Photo The Irvington-Hudson River Tiffany Trail. After a scrumptious picnic lunch prepared by a local chef, we wended our way over hill and dale to downtown Tarrytown to tarry there a while. We took in the beautiful Tiffany window in the Dutch Reformed Church and got a private tour of the church including seeing the clock mechanism that rings its bells. The bell rope was nearby but we resisted the urge to pull it. Tarrytown Music Hall. Photo Ed from Queens flickr.com/people19195351@N00. 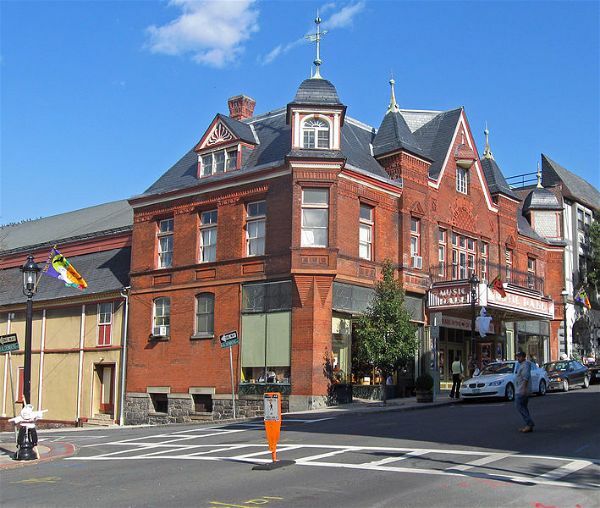 We also visited the beautiful and historic Queen-Anne-style Tarrytown Music Hall which narrowly escaped the fate of being paved and turned into a parking lot in the ‘70s. It is now back to its rightful use as a venue for major and not so major acts. I recently saw “Romeo and Juliet” performed there by an Indian Khatak dance troupe. Many ladies in the audience wore beautiful Punjabi suits that were almost more beautiful than the ones on stage. It was a treat to see all these colorfully dressed ladies walking down Main Street. But I digress. Jonathan Kruk performing Irving's "Legend" at The Old Dutch Church in Sleepy Hollow. Photo Tom Nycz. Next up was Jonathan Kruk’s retelling of Irving’s “Legend” in The Old Dutch Church, the same church that Washington Irving attended and adjacent to the cemetery in which he is buried. Jonathan bounded up and down the aisles as he portrayed the first nerd, schoolmaster Ichabod Crane, a naughty schoolboy, Brom Bones, Katrina Van Tassel, and many of the other characters in the famous tale. The Headless Horseman at Horseman's Hollow. Photo Jennifer Mitchell. Across the street at Horseman’s Hollow, the haunted village on the grounds of Philipsburg Manor, we saw Ichabod and Katrina in person! Imagine that, raised from the dead during Halloween time. The many shrieks and screams coming from Horseman’s Hollow proved the existence of many ghosts, goblins, phantoms, ghouls, trolls, and zombies in the Manor, and we even caught a glimpse of the Headless Horseman. Guests with Tarrytown Lighthouse, the two Tappan Zee Bridges, and NYC skyline in background. Photo Travellati Tours. 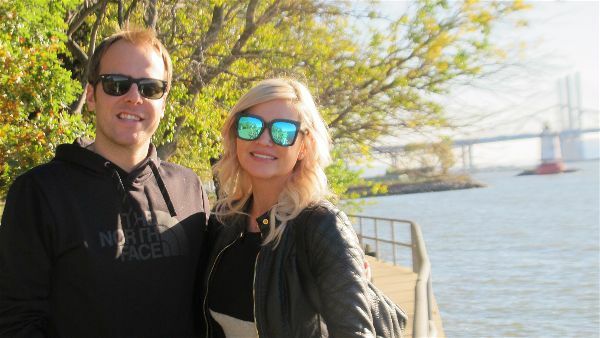 We had a gourmet picnic at Kingsland Point Park with a view of the Tarrytown Lighthouse, the two Tappan Zee Bridges, and of the Manhattan skyline 25 miles away. We were also lucky to see the Clearwater, the 90-foot long recreation of a 19th-century Hudson River Sloop, passing down river on one day and back up river on the next. The Circus Train engine puffing purple steam at the Great Jack O'Lantern Blaze at Van Cortlandt Manor. Photo Travellati Tours. 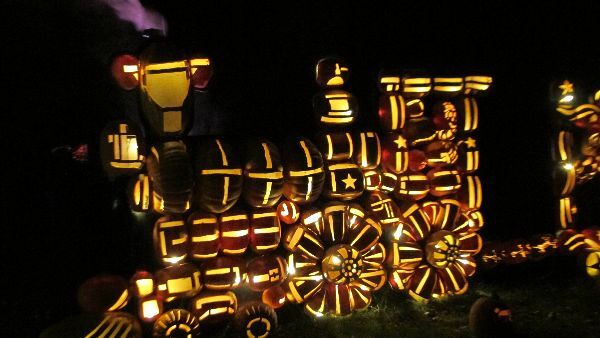 The Grand Finale was a visit to the Great Jack O’Lantern Blaze at the Van Cortlandt Manor in Croton-on-Hudson. What a feast for the eyes and ears! Thousands of pumpkins had been carved into innumerable designs, from the ghoulish to the elegant, the naturalistic to the surreal, with one theme following another along the route. Eerie electronic music accompanied each vignette. Sculpture of the Headless Horseman pursuing Ichabod Crane in Sleepy Hollow. Photo Travellati Tours. 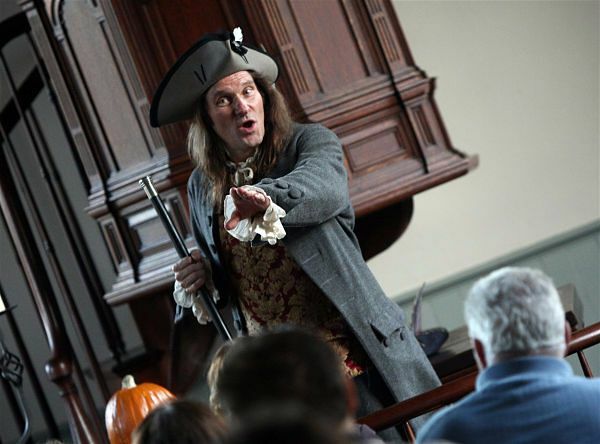 Plan now to attend one of our Sleepy Hollow Halloween Tours next year – we already have three reservations! Since the Tarrytown and Sleepy Hollow Halloween events become more popular every year, tickets sell out quickly so plan a head. I mean ahead. Guests at an outdoor café in Céret, France, Picasso's home-away-from-home. Photo Travellati Tours. Speaking of planning ahead, for those of you considering your 2018 travel plans, we are offering Early Bird Pricing until November 15 for our Picasso’s Pyrenees Tour in May and our Papa’s Paris Tour in June. That’s only six months away. Book now and have a unique and fabulous vacation to look forward to! Gertrude Stein (Constance Bradburn) and Ernest Hemingway (David Coburn) performing for our guests in the Luxembourg Gardens in Paris. Photo Travellati Tours.